Yes, you read correctly! 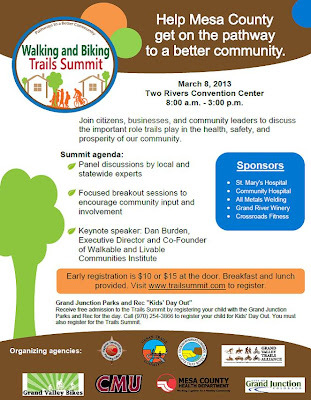 Join GVB for the inaugural Trails Summit to highlight the importance of a walkable and bikable community here in our Grand Valley. The Summit will bring together local businesses, leaders, engineers and citizens as well as a national visionary, Dan Burden! Register at www.trailsummit.com today and be part of the conversation on March 8th! Click on the poster to enlarge it and email us at grandvalleybikes@gmail.com to receive a poster to hang at work.